In addition to all of the data and economic assessments we consider, we also do a lot of listening. The nine Low Pay Commissioners have recently spent two days questioning representatives of employees and employers who were able to give us the colour behind all the written evidence they've sent in. During the year we also do visits across the UK to talk directly with employers and employees to figure out just how far we can go in raising minimum pay rates without significantly reducing employment. And this blog is to give you the insight from one of these visits ahead of us making recommendations for rates for under 25 year olds and Apprentices in February 2016. Wednesday of last week started for me around 4.30am when I got up to head off to Essex. I stopped briefly for breakfast at Stratford station and seeing the Christmas tree sparkle in the early morning light while commuters bustled alongside it, I was reminded just how hectic December often is. This must also be the case for many of the small and medium sized businesses (SMEs) who make up nearly half of all private sector turnover in the UK. These businesses take over £1.8 trillion through their tills and employ over 15.5m people. Importantly they're also achieving over 3% growth for our country and it is these companies I am particularly interested in right now given that my background is with big business. I have worked for some of the largest companies in the world - in the USA, in Europe and the UK - so I understand this part of our economy really well. But as a new Low Pay Commissioner I am keen now to understand small and medium sized businesses equally clearly. 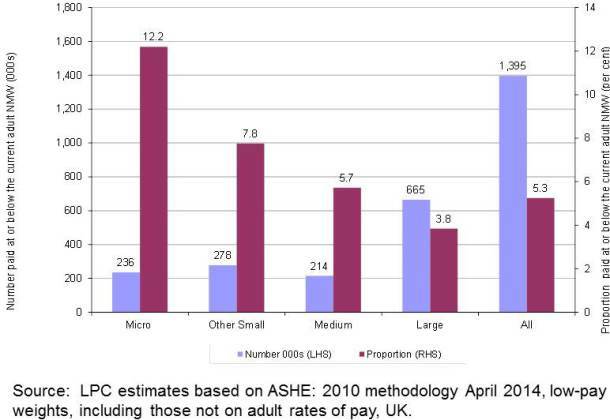 Source: LPC estimates based on ASHE:2010 methodology April 2014, low-pay weights, including those not on adult rates of pay, UK. So back to Stratford Station. From here I head to Essex to meet with David Norgrove, the Chair of the Low Pay Commission, Simon Blake, the Secretary and Tim Butcher the Chief Economist. Our first visit is with a family bakery firm with a proud heritage. We meet a husband and wife - owners of the business who have both already been at work for many hours. We're introduced to the master baker who is busy rolling pastry for fresh sausage rolls and the staff in store who proudly display an amazing array of artisanal bread, cakes and morning goods. Reminds me of when I worked in a bakery as a student - trays and trays of tempting treats made by skilled people who had been out of their beds since before midnight ensuring it was all fresh every morning. From the bakery we went on to meet with another family business - this time owners of a chain of hotels, nightclubs and pubs. Then a recruitment company providing agency staff across many diverse businesses and then a group of owners all delivering domiciliary care to people in need. And finally we joined a session with business owners in Grays, kindly hosted by the Essex Chamber of Commerce. Firstly it is clear that all the business owners we met were keen to do the 'right thing' for their employees. In SMEs, the owners often know their people really well and each employer showed us how they have found the money to accommodate the minimum wage since it was introduced in 1999. And they are not alone. By the end of 2015, over 1.5m people will have had their pay raised and the evidence shows that despite some concerns from business, the benefits have outweighed the costs. Secondly, we saw huge ingenuity from business owners and their people on how they have improved their productivity alongside raising wage costs over the past decade. We should not kid ourselves - some businesses have responded to higher wages by lowering costs and damaged their sales in the process. But many of the businesses we met on Wednesday had worked hard to keep innovating and investing to improve their competitiveness despite escalating costs. Thirdly, 2016 is going to introduce a completely new level of challenge to business with the introduction of the National Living Wage (NLW) rate for those aged 25 and over. NLW represents a major boost to incomes but it will also disproportionately affect SMEs and low-paying sectors such as cleaning, retail, hospitality and social care. We heard from many businesses on Wednesday that they are not yet entirely sure how they will adjust to the new rate for over 25s of £7.20. It is rarely black and white and many business owners appreciated that higher wages could give them a better chance of achieving lower turnover amongst their staff - but the rate of increase would be a challenge requiring new solutions. Fourthly, 2020 will be a watershed moment. Assuming that sustained economic growth continues, the number of jobs that will be affected by one of the minimum wage rates will be 3.8m (and represents an increase which is faster in six years than the previous thirteen). One of the people we spoke to described the challenge as 'scaring the living daylight out of me'. To achieve a 'higher wage, higher skill' economy will clearly require a lot of SMEs over the coming years and the government's forecast that it could also cost 60,000 jobs will need to be monitored carefully given that this is one of the biggest changes to wage policy since the introduction of the national minimum wage in 1999.